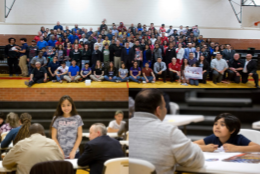 On March 7, 2017, Lockheed Martin, Bell Helicopter, BNSF Railway, Fort Worth Hispanic Chamber joined together to host a Speed Mentoring for the Project Lead the Way campus, Diamond Hill Jarvis High School. Many of us shared our stories, motivated students and enlightened a community. Thank you for being all in, shattering silos and raising the bar for the Diamond Hill Jarvis community. Please check out pictures below. Also, check out the LM Aero Vision showcasing our event. Thanks again and see you next year! If you are interested in helping out this community please contact Rebekah Mc Donald Lee, Academic Coordinator of DHJ HS.